When trying a class, wear something comfortable to move and exercise in. Generally long pants are preferred; usually visitors and beginners tend to come in jogging pants and a tshirt. If you have a dogi (uniform) from another context you can wear this, with a white belt. It’s worth bringing a water bottle as well. No shoes or hats are allowed in the dojo. Leave these in the hall before entering. For the most part, pay attention to what others are doing and just do your best to follow along. In the Japanese style of teaching, being observant and attentive is what is emphasized in order to learn. Classes tend to not have much talking, and calling out to the teacher or others is discouraged. Be respectful of the space, the teachers, and the others at the dojo. See the pages about classes, fees, and scheduling for more details! 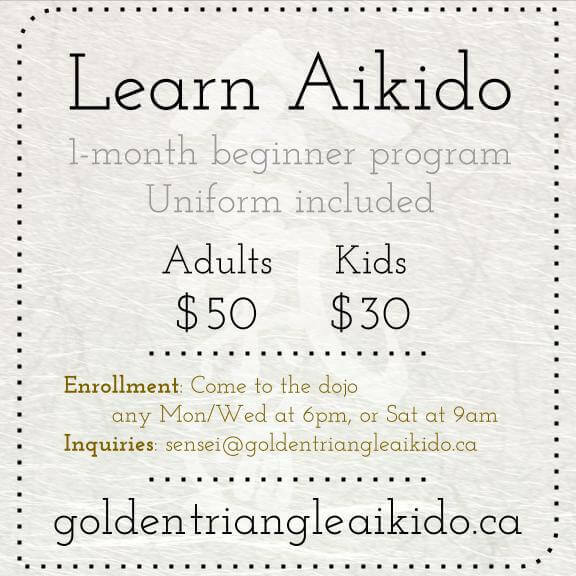 You can also learn more about the history of Aikido, and read about our lineage.